Sitting around one evening, my husband decided to take it upon himself to come up with a new place for us to go out for a Friday night dinner for just the two of us. We had kind of gotten into a rut of always going to the same places or doing the same things that my husband felt like it was time to shake things up a bit and just try something new. Suddenly, after looking at restaurants in our neighborhood, my husband found a restaurant that he became very excited about. He was so eager to try this place once he learned about it that I couldn’t deny him and agreed to go along with it, even though I was a bit skeptical. Soleil Westwood is a French Canadian restaurant and bar that’s been in our neighborhood for over 10 years. And as many times as we’ve driven back and forth past the restaurant, I don’t think I ever looked twice at it until my husband decided to bring me here for dinner. While French restaurants aren’t a novelty here in Los Angeles, I’m not sure I’ve ever seen a French Canadian restaurant before. The restaurant’s owner, who is French Canadian and has roots in the province of Quebec, decided to open his own restaurant specializing in cuisine from his hometown after having spent years working as a waiter and manager in various Los Angeles eateries after having moved to the area from Montreal over 20 years ago. The bar area of the restaurant focuses on Canadian fare and may be one of the only places in the area that I know of that offers a wide range poutine. The restaurant portion focuses on French cuisine. The restaurant itself has such a different atmosphere. There’s both indoors and outdoors seating where the outdoors is a covered patio, where we were seated. It was such a nice night out that sitting out on the patio was just lovely. 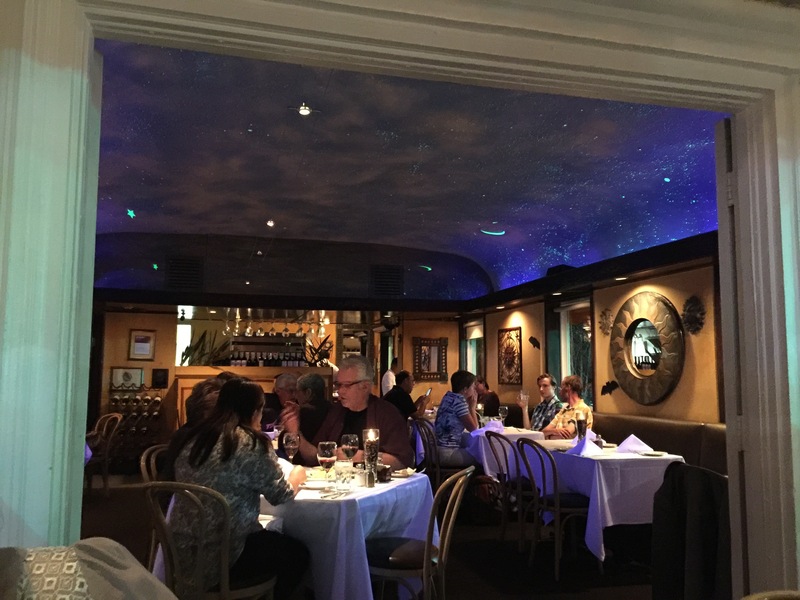 The indoor seating area of the restaurant was decorated to make it look like it was actually outdoor with stars and wispy white clouds painted into the ceiling with matching moody blue light to look like the night sky. It was actually quite pretty and romantic, and just different, like the whole restaurant. 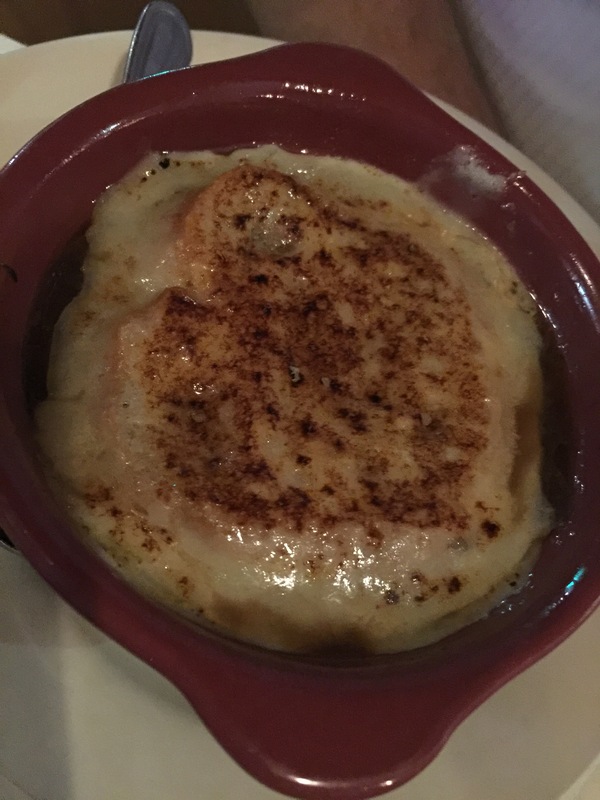 My husband who always says that he doesn’t particularly like soup, always seems to light up when you mention French onion soup, which has to be his favorite soup. We’re at a French cuisine restaurant, so of course he’s going to order the French onion soup. Made with onions in a savory beef broth baked and topped with a Gruyere cheese gratinee, my husband really liked this soup. First off, one of the reasons my husband doesn’t like soup is that it usually comes out scalding hot, which he can’t stand. Funny enough one of the first things he said about this French onion soup was that it was served at a good temperature – which means, not too hot – that he could just spoon it up and enjoy it rather than waiting for it to cool down. For him, this is a good thing. The soup wasn’t too salty, which is also important with French onion soup, as sometimes the broth can just be so salty it’s hard to enjoy. As a starter we decided to order the plateau de Fromage, better known as the cheese plate. 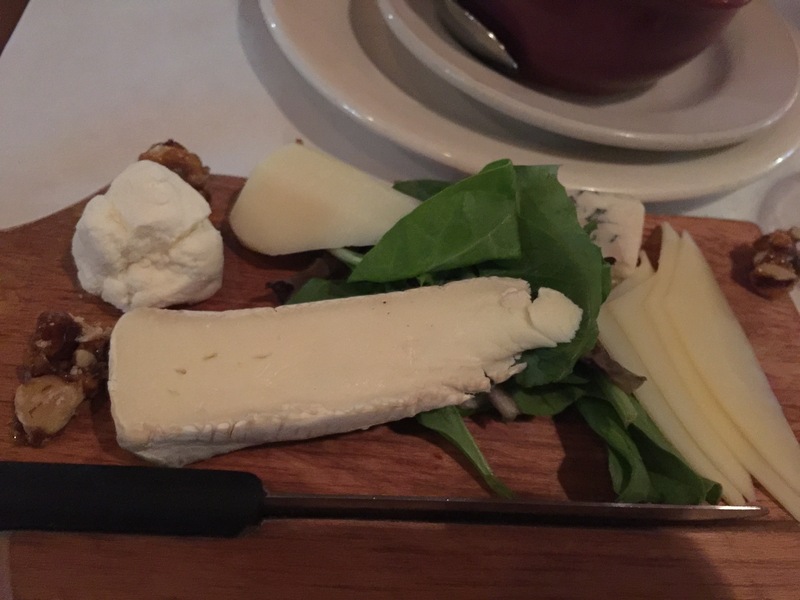 This was an assortment of cheeses served with crackers and French bread on a wooden carving board. The cheeses included a Gorgonzola cheese for the blue cheese selection, a goat cheese, a hard sliced cheese and a soft cheese that was similar to brie, but wasn’t quite brie. The Gorgonzola was delicious and both of our favorite cheeses on the cheese plate. My husband, who is a fan of brie enjoyed the soft cheese that was served to us as it had great texture and subtle flavor. The sliced hard cheese, which was similar to cheddar, but wasn’t quite cheddar, was the least successful cheese on the plate and the one we enjoyed the least, just because the flavor was missing. For my entrée, I ordered a dish called Sam and Jen. 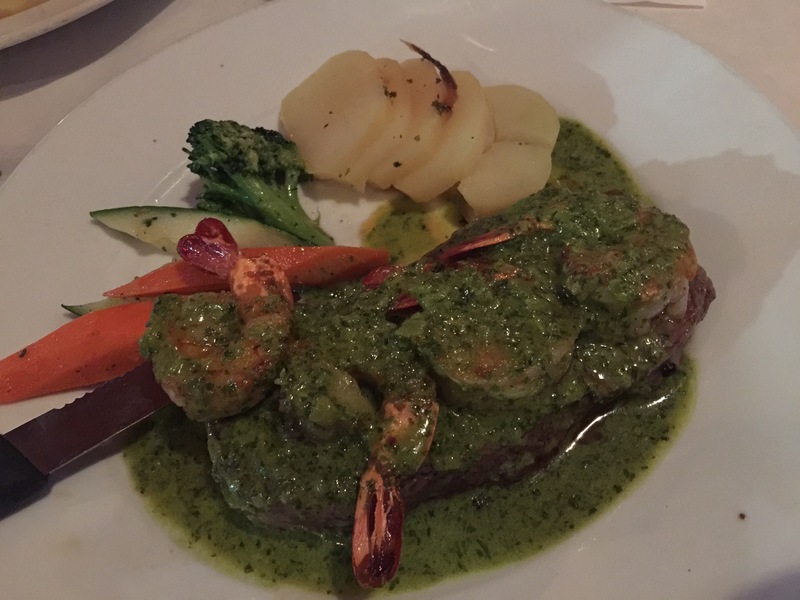 It was a combination of grilled New York steak and grilled tiger shrimp topped with cafe de Paris sauce, served with steamed vegetables and a choice of potatoes, for which I chose potatoes gratin. First off, the cafe de Paris sauce was really terrific and flavorful, it made the whole dish and really brought the steak and the shrimp together in a cohesive fashion. The tiger shrimp were perfectly grilled, a little crispy and crunchy on the outside and perfectly tender and succulent on the inside. This is one of the best shrimp dishes and preparations I’ve had in a long time. The New York steak was cooked to a perfect medium rare, as requested. The steak was hearty and delicious. The meal overall was very filling, and very satisfying. My husband decided at the last minute to order something not on the menu, but rather the night’s special crepe du jour, or crepe of the day. Each day, Soleil features a different savory crepe which is served for dinner. 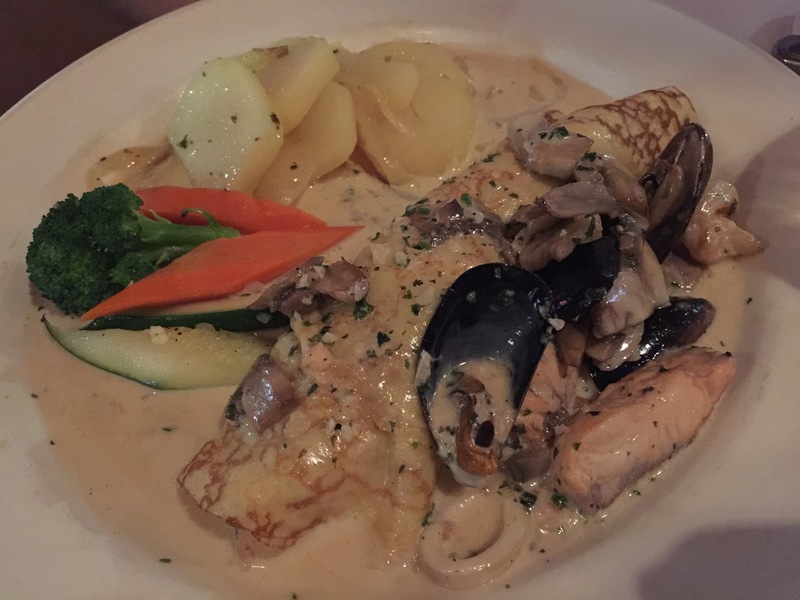 Tonight’s option was a seafood crepe filled with salmon, shrimp, mussels and calamari are coated in a garlic cream sauce. When I saw the crepe come out drenched in sauce, I was a bit concerned if my husband would like this dish because he’s not generally a fan of any sort of sauce at all. Surprisingly, he thought that the sauce was the best part of the dish. He said that the garlic cream sauce was terrific and flavorful. The crepe was chock full of seafood and my husband said it was just perfect. He only wished he could have had two entrees, he liked it that much. When it came time for dessert, we each decided to get our own dessert. My husband ordered the feuillete de Fraise. 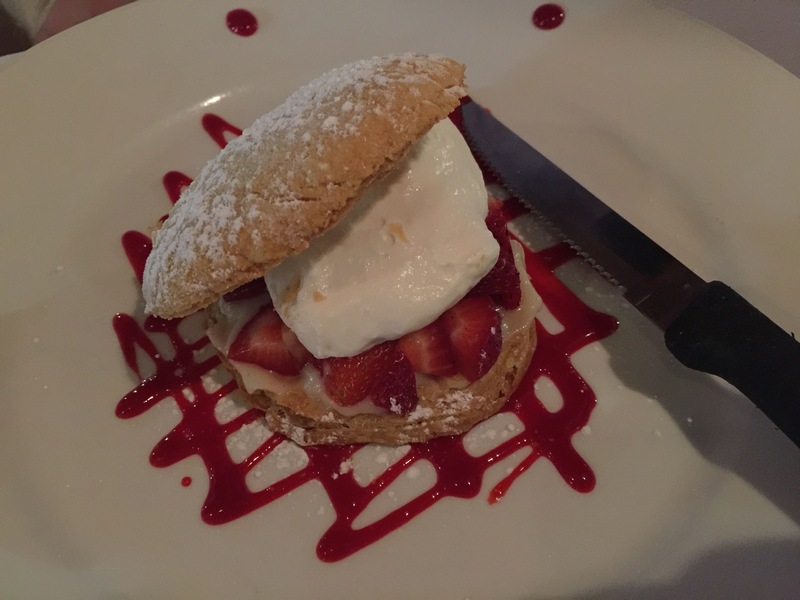 In English, this is basically a puff pastry filled with Bavarian cream, fresh strawberries, whipped cream and fruit coulis. Had I not chosen the dessert I did, I would have chosen this dessert. I am a huge fan of Bavarian cream, and anything with strawberries and whipped cream I’m sure is amazing. My husband really enjoyed this desert as the puff pastry wasn’t too heavy, and was perfectly baked and flaky. The flavor of the fresh strawberries and the fruit coulis gave the dessert that terrific tang that was then soothed by the slightly sweetened whipped cream and the creamy and rich Bavarian cream. This was a nice light, and tasty dessert. For my dessert, I ordered the chocolate crepe. 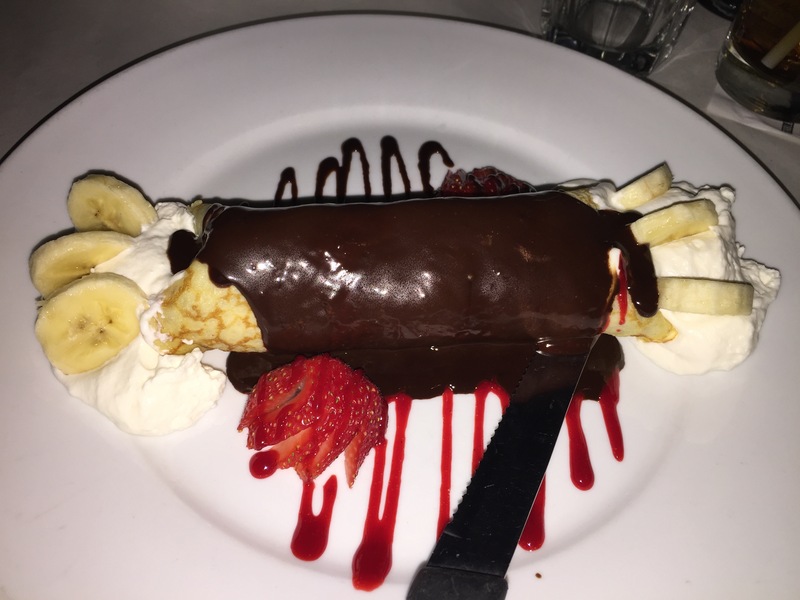 This dessert crepe was filled with vanilla ice cream and served with bananas, strawberries, Belgian chocolate and whipped cream. For me,this is the perfect combination of flavors, bananas, chocolate, whipped cream and strawberry. As my husband discovered with his savory crepe, I thought my dessert crepe was perfectly cooked. It was light and airy, but there was enough elasticity in it to hold up when being rolled and filled with ice cream and whipped cream. The tang of the strawberry was necessary to cut through the richness of the Belgian chocolate. The banana added a sweet subtle flavor that paired well with the ice cream and the whipped cream. This was certainly a decadent dessert, but it ended my meal on a high note. Some times, we travel far and wide in order to seek out good food, and yet, good food is easy to find just around the corner from where we already live. 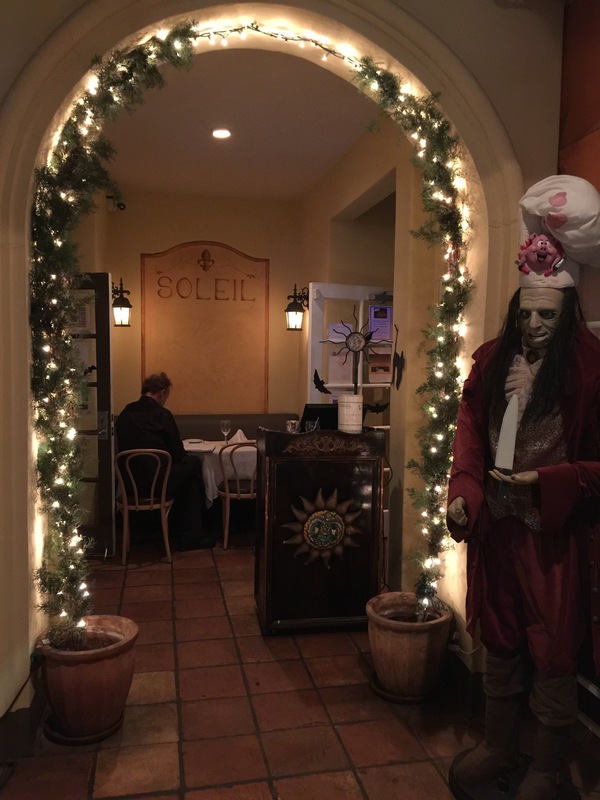 I don’t know how many times I’ve driven by Soleil Westwood in the years that I’ve lived here, and I’ve never given the restaurant a second glance, nor had I ever even wondered what kind of restaurant it was or what they served. Sadly, I was missing a gem in my own backyard. First off, where else can I even find a French-Canadian restaurant outside of Canada? And while we didn’t sit in the bar and order poutine, I’ve now discovered a place in Southern California that serves poutine! How exciting is that? My husband and I both enjoyed our dinner at Soleil Westwood tremendously. Terrific French food in a beautiful and relaxing setting. This was a terrific date-night restaurant, one that we both still talk about and reminisce on. Merci, Beaucoup! Next time, please stop by and say hello.